With 2017 fully under way, researchers around the world are taking a hard look at their ambitious milestones. How can we improve our processes? How can we meet our time-sensitive deadlines? Offering a multitude of solutions, SGI-DNA seeks to address those questions with the following list of new and innovative products. Vmax™ Express enables the production of significantly more recombinant protein (up to 4X), a full day faster than E.coli protein expression systems. Syn2.0™ Minimal Synthetic Cells are engineered cells with a genome smaller than that of any autonomously replicating cell found in nature. These cells have many potential applications, notably as a platform for investigating core functions of living organisms. Syn2.0 Minimal Synthetic Cells have a genome of approximately 576 kb and a doubling time of about 92 minutes. Syn3.0™ Minimal Synthetic Cells, like Syn2.0, have many potential applications as well. Syn3.0 Minimal Synthetic Cells have a genome of approximately 531 kb and a doubling time of about 180 minutes. 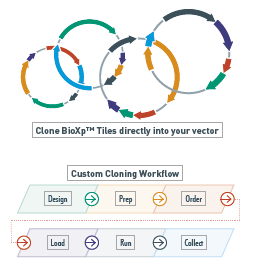 The Custom Cloning Module on the BioXp™ System allows you to clone up to 32 unique, synthetic genes directly into your vector-of-choice in an automated, hands-free, overnight run, eliminating the need for sub-cloning. The BioXp™ NGS Library Construction Kit automates and simplifies next-generation sequencing libraries for up to 8 or 16 samples. Built for Illumina sequencing platforms, it enables hands-free construction of barcoded libraries in under 5 hours. The Bio360™ Minifuge is compact and economical microcentrifuge for tubes and strips, is the ideal companion to the BioXp™ System. XactEdit™ Cas9 Nuclease kits and enzymes allow you to perform targeted guide RNA-directed double-stranded DNA cleavage. For added flexibility, the enzyme is available in normal and concentrated formats and the corollary kit includes a positive control, making it an ideal choice for first-time users. In 2017, we're looking forward to several new products and their exciting applications, especially with regards to the Vmax™ Express product line. In the meantime, if you would like to know how to get #DNAMyWay download your copy of the Gibson Assembly® Cloning Guide today.